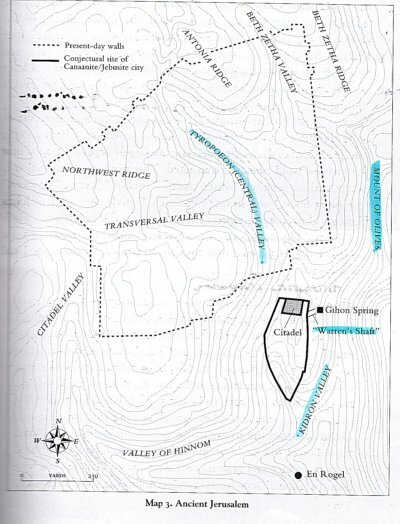 The map of Jerusalem shows its beginning as a mountain fortress, suitable for habitation because of the natural Gihon spring nearby. Up until the time of King David it was ruled by Canaanites & Amorites, of which the Jebusites were an offshoot. David brought Jerusalem under Israelite control, and it remains as such to this very day. Cline, Eric H. Jerusalem Besieged: from Ancient Canaan to Modern Israel. Ann Arbor: University of Michigan, 2004. Print. Brisco, Thomas C. Holman Bible Atlas. Nashville: Broadman & Holman Pub, 1999. Print. Rocca, Samuel. The Forts of Judaea 168 BC - AD 73. New York: Osprey, 2008. Print. Click on a link below to skip to that section of the webpage. Each period of history for Jerusalem almost comes with a different map of Jerusalem. For each civilization, people, empire, and king that occupied Ariel, a different city took form. One will notice the changes on the map of Jerusalem from one period to the next. One must also be familiar with the geography found on a map of Jerusalem. The map below provides a comprehensive view of Jerusalem and the surrounding area. Ancient Jerusalem sat along the Central Ridge Route. This was the main artery of traffic through the Central Ridge of the Western Mountains. It connected Beersheba in the south, with Shechem and Mt. Gerizim in the north. This map of Jerusalem highlights the vast differences in geography found within short distances of Jerusalem. PALESTINE GEO-REGIONS Jerusalem sat atop the watershed of Palestine. From the Central Ridge, water descended to the east via wadis to the Jordan Valley below. From there it gathered into the Jordan River, and emptied into the Dead Sea, its final resting place. The descent into the Jordan Valley was rapid and abrupt, dropping over 3,500 feet from the Mount of Olives to Jericho, approximately 15 miles to the east. In the west the water descended at a much more gradual rate. One notices on the map of Jerusalem the many streams, rivers, and brooks along the Coastal Plain. The water descended from the Central Ridge via these western flowing streams, rivers and brooks and emptied into the Great Sea. To the east and southeast of Jerusalem, as evident on this map, was a vast and barren wilderness. This was the Judean Wilderness, and the likely location of Christ's temptation by Satan. The road from Jerusalem to Jericho ran through a part of this wilderness, and was the site for Jesus' parable of the Good Samaritan. 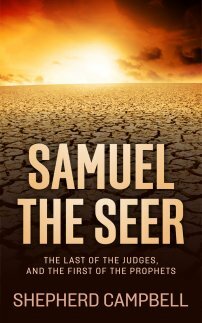 The ancient city of Jerusalem often fought with Shechem for control of the Central Highlands. Once Israel established itself in the land, they fought with the Philistines, located along the Plain of Philistia, location of the five cities of the Philistine Pentapolis. On the map of Jerusalem, one notices the Shephelah as resting between the mountains and the plains. This was the site of many battles between Israel and the Philistines. The Philistine force was centered on the plains, where they could best utilize their chariot forces. Israel, lacking such technology, stayed in the hills and highlands, where the chariot advantage was negated. The Philistines would encroach upon Israel and Jerusalem by establishing strongholds in the Western Mountains, such as the one surprised by Jonathan in I Samuel 14. ANCIENT JEBUS Jerusalem in the Old Testament was first occupied by an Amorite/Hittite peoples known as the Jebusites. 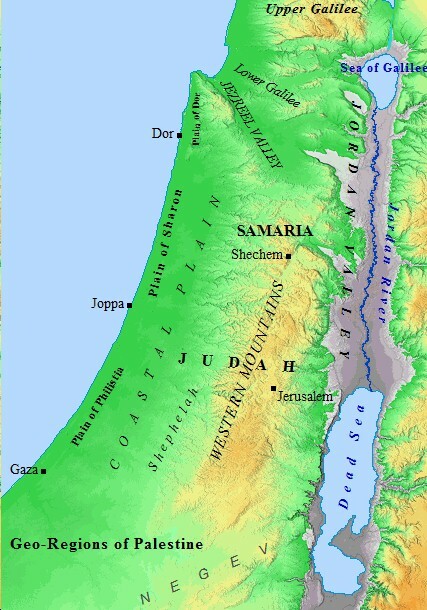 Jebus occupied the southern portion of the eastern ridge, indicated on the map of Jerusalem below. The eastern ridge was a wedge-shaped island of rock, surrounded on three sides by valleys. To the east was the Kidron Valley, which separated Jerusalem from the Mount of Olives. To the west was the Tyropoeon Valley, which separated the City of David from the Lower & Upper Cities of later Jerusalem, and on the south by the Valley of Hinnom, also known as Gehenna. This valley was identified with Hell, or Sheol in the Old Testament. THE MAP OF JERUSALEM DURING THE TIME OF THE JUDGES & KING DAVID, ca. 1200 - 1000 BC. The eastern ridge was a naturally plateaued ridge, with the northern end higher up than the southern end, Jebus. Just to the north of the original settlement was a hill, the hill of Ophel. This hill led to the Temple Mount, built by Solomon. It was originally a threshing floor, purchased by David from a local Jebusite. It was a strategic site due to the natural water found in the Gihon Spring, located near the letter "i" in Kidron on the map. The Upper and Lower Cities were located on the western ridge. The western ridge was divided in two by another valley called the Transversal Valley, which was elevated above the aforementioned three. Ancient Jerusalem began on the southern portion of the eastern ridge, from which a wall has been unearthed dating back to 1800 B.C. However, by the first century AD, it had spread to the western ridge, occupying both the Lower and Upper Cities, and had branched into the suburbs to the north, known as Bezetha. VALLEYS OF JERUSALEM This map, from Jerusalem Besieged, plainly depicts the surrounding valleys of ancient Jerusalem. The history of Jerusalem was shaped in large part by these hills and valleys, which helped form this mountain fortress. 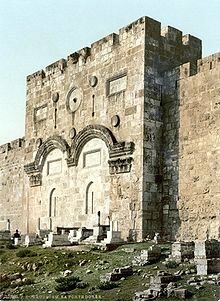 The Citadel was what David is said to have built up once he captured Jebus in II Samuel 5:9 The exact function of the Millo is unknown. Remains from a stepped-stone structure have been uncovered dating to the 13th/12th century BC that many feel is the "Millo" discussed in the Bible. The dotted lines represent the modern-day walls of Jerusalem. 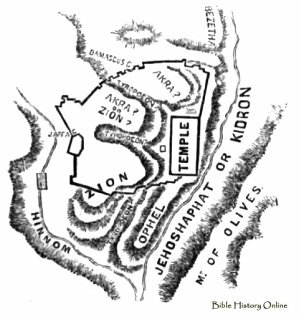 The Mount of Olives is located on the right side of this map of Jerusalem. The Tyropoeon Valley is located in the center of the picture, dividing the eastern and western ridges. VALLEY OF TOMBS The Kidron Valley is also home to tombs of some of Israel's most notable, and notorious, individuals. 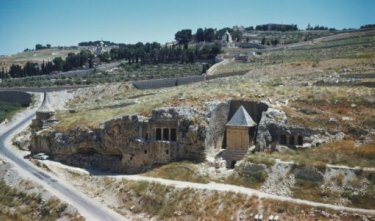 This picture depicts the tombs of Zechariah (with pillars) and Absalom (gabled roof). Absalom was a son of David, though not the heir of David, which was of course Solomon. Absalom's mother was Maacah. Maacah was the daughter of Talmai, identified as the King of Geshur in II Samuel 3:3. Absalom took his royal bloodline to heart, as he rebelled against his father in an attempt to usurp the throne of Israel. David initially fled Jerusalem, only to return after the rebellion was put down. To this day, visitors to the Tomb of Absalom in the Kidron Valley cast stones at this monument of ancient Jerusalem. 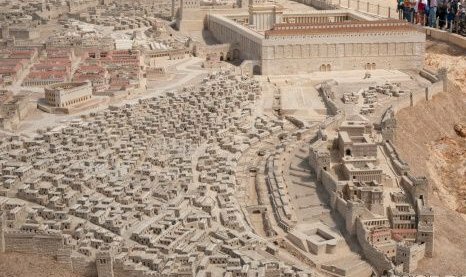 CITY OF DAVID This model map of Jerusalem depicts the Old City, or City of David, conquered from the Jebusites. Notice the fortifications of the city. The walls, which were built along the southern slopes of the eastern ridge, encompassed an original settlement of 8 acres. In this picture, one notices the wall-like structure at the top of the photo, with the arch connecting to it in the upper left. This is the Temple, and the arched staircase leading to it's Outer Courts. During Solomon's day, the Temple of God must have towered above the less-elevated City of David. To the right of the city, out of view of this picture, is the Kidron Valley. From the western walls of the City of David the Lower City (in view) sprang up, and climbed the hill to the Upper City above (out of view). Joab climbed the water shaft from the Gihon Spring into the Jebusite city to the left. From that point on, Jerusalem would be at the center of Israelite/Jewish consciousness. 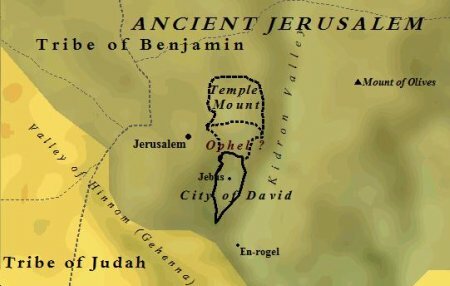 GEOGRAPHY OF JERUSALEM Notice the shape of the hill of Ophel on the map of Jerusalem to the left corresponds to the shape of the model of the City of David above. The valleys of Kidron and Hinnom are also in plain view. The Tyropoeon Valley can be seen between Zion and Ophel. The Transversal Valley protrudes into Zion, dividing the western ridge in two. The Mount of Olives sat to the east and provided a beautiful view of the Temple Mount. Jesus Christ is frequently pictured resting on the Mt. of Olives. The Holy Land Model of Jerusalem found in Jerusalem brings a three dimensional perspective to the map of Jerusalem. The eastern and western ridges can plainly be seen in relation to each other. The Temple on Mount Moriah dominates the city, as it towers above the City of David. 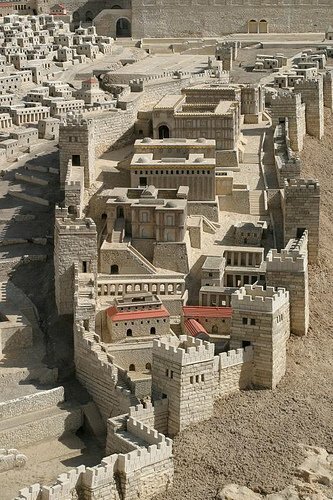 The Lower & Upper cities are also evident, as the walls from the Old City separated it from the newer parts of Jerusalem. Notice the hut-looking structures of the Lower City give way to the more expensive looking structures of the Upper City. Herod's theatre can be seen rising above the Lower City. The Antonia Fortress can just be discerned attached to the Temple at the top right of the photograph. This is first century AD Jerusalem, as it was during the time of Jesus. Notice the arch, and the bridge behind it, both connecting the city to the Temple. The grand size of Herod's Temple cannot be appreciated by the modern era.